Health Care 4 All is an international charity organisation (UK Registered Charity Number 1158474) committed to providing health care worldwide, particularly in developing countries and remote rural areas, through the use of modern telemedicine technology with innovation and conventional healthcare services. Our aim is to provide health care to remote rural communities worldwide, in particular developing countries that have very limited to no access to health care. Particular emphasis will be placed on maternal and child health as well as preventative medicine. In many parts of the world people have to make a long and arduous journey to the nearest medical facility to even get basic healthcare. 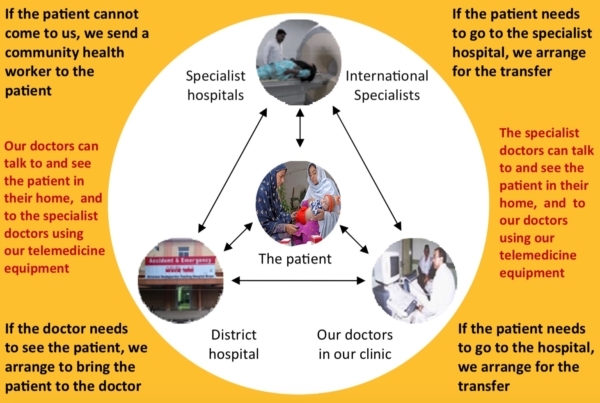 Healthcare 4 All International provides medical and nursing care for these communities through the use of community health workers, doctors and nurses aided by a Novel Hybrid System of Telemedicine (NHST) technology. Community health workers (carrying routine use medicines, first aid kits, emergency drugs and a laptop/tablet computer) travel to the patient in a specially modified ambulance and provide care in the patients home with advice from the doctors. The patient (aided by the community health worker) talks to the doctor in the local health clinic, local hospital or the specialist hospital via telemedicine technology. The patient’s condition and clinical observations are transmitted to the doctor by the community health workers through telemedicine and recording apps. The patient’s medical details are available to the doctor and community health worker via an app on their hand held tablet and a remote Electronic Medical Records Database. Patients who need escalated treatment are transferred to our treatment centre or to secondary care hospitals as required in the same ambulance that the community health workers use to attend the call. We also have community based telemedicine monitoring and walk in treatment centres. These centres are fully staffed with doctors and nurses, equipped with a diagnostic laboratory, pharmacy, minor operating room and day care beds. These facilities are available round the clock 365 days a year. All treatments we provide including investigations, medicines and transfers are free to all deserving patients. The concept of Novel Hybrid System of Telemedicine (NHST) was put to test as a pilot study in 2015. The study was carried out in villages of Mawa Rarrah in District Mirpur, Azad Kashmir, Pakistan. The analysis of the data was overwhelmingly positive and later in the same year we went into a service mode in the same villages covering a population of approximately 10,000 inhabitants. The need of health care services from the communities in nearby villages made us extend our services. In 2018 our second centre in villages of Chakswari started operating. This centre is purpose built with increased diagnostic and treatment facilities as well as a well equipped pharmacy. The model is designed to generate funds and donations from the local community to be recycled into the charity and to cover some of the costs of free treatment, investigations and medicines that is provided to all deserving patients to sustain and scale up the services. Through this centre we cover a population of over 50,000 inhabitants. Our patients come from villages spreading across a wide area from Islamgarh to Dudyal in Mirpur, Azad Kashmir. We take on trauma and accident cases from the area. We also provide care for long term chronic illnesses mostly in patient’s homes. Antenatal care for pregnant ladies is also provided with an emphasis on children’s healthcare. Gynaecological services to women are provided by female Gynae trained lady doctors and healthcare workers.